I must be mad! I have an older MaltyX (or Cross Maltese, as the vet likes to call him) called Aladdin. He was joined 4 years ago by Sinbad, the Tenterfield Terrier/Cattle dog mix. Then came Attilla, the pure bred Tenterfield. Now, as many of you know, these particular terriers are challenges all of their own in terms of temperament, activity levels and sheer stubbornness, although they are enormously loyal, loving companions. When my husband passed away I thought that a new puppy (dog number 4, what was I thinking?) would ease my pain. 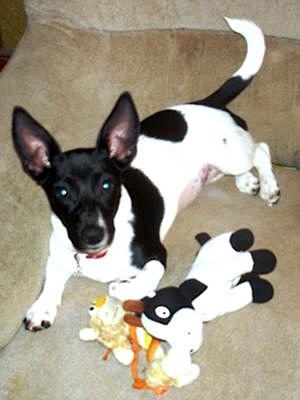 Enter Boadecea, a black and white puddin JRT puppy, now 11 months old! Chaos escalated to a whole new level. She is adorable, but she is chewy, barky, smart as paint, stubborn, inquisitive, brave, foolhardy and .....she is a JRT! All my lovely guys keep me safe, fit and happy, but Boadie (aka Evil in a Dog Suit and a Fresian Cow Disguised as a Dog) makes me realize why people become addicted to JRTs.